In more detail, your objective is to storm the enemy castle and take possession of their copy of the Necronomicon. The shields represent the defense value of the castle, and to storm a castle, you have to carry out an attack (swords) superior to its defenses (shields). To launch an attack, you should gather army formations, which are represented by soldiers, bowmen, and siege weapons cards. (You can attack with one or several cards at once.) Note that a castle cannot be attacked while its walls protect it. The village deck provides the basic resources of your village: soldiers, archers, gold, cultists, sacrifices, builders, thieves, etc. You start with five cards, and on each turn you steal a card from this deck and carry out one single action: attack, defend, build, call up, sacrifice, etc. Lay ambushes for your enemies, steal their gold, and surprise them with a night-time attack so they can't tell what you're attacking them with. Use the arcane knowledge of your cultists to call up the powerful creatures of the Cthulhu deck and scare the wits out of your rival while in combat. The siege deck contains siege weapons to carry out more powerful attacks, and you can use builders and gold to construct your siege weapons. 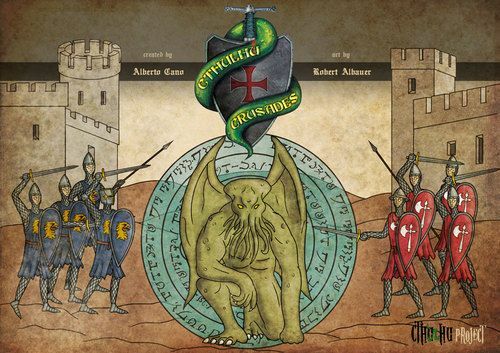 Get special cards to scale the walls with greater speed and trick your enemies with the Cthulhu offering. The sea hides the terrible Deep Ones. If you manage to keep them happy by offering sacrifices, they will reward you with additional resources — but you never know how many Deep Ones might come!